Meet the Ohio University English alum who manages American Airlines digital platforms and just launched the new AAdvantage redesign, including a mobile app, on Friday, Feb. 1, at 3 p.m. in Ellis 014. 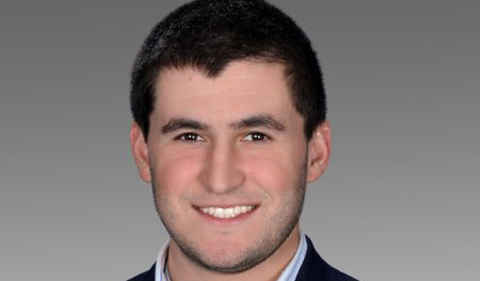 Aaron Schwarz (’11) has held several positions in the corporate digital marketing world and currently works as a Senior Analyst of New Product Development with American Airlines. Connect with Schwarz on LinkedIn or find him on Twitter and Facebook. He graduated with a degree in English from the College of Arts & Sciences in 2011. A 2011 Ohio University graduate, Schwarz earned an English degree from the College of Arts & Sciences. While at OHIO, he enjoyed writing for The Post, playing intramural hockey and spending time with friends on Court Street. Since graduation, his career path has focused heavily on digital marketing, with stops at a PR firm, digital agencies and Hilton Worldwide. Currently, Schwarz works at American Airlines as a Senior Analyst of New Product Development. He lives in Dallas with his wife, Michelle, and their black lab, Molly. In his spare time, he can be found at any Dallas sporting event, running or on a plane traveling somewhere new. Manage big digital projects for American Airlines, specifically projects on aa.com, aa.com mobile web and the American Airlines mobile app. Work with digital stakeholders across AA including AAdvantage Loyalty, IT, User Experience Designers, User Testing, Analytics and Content. Responsible for creating an engaging, forward thinking and seamless user experience across all digital platforms. Launched AAdvantage Redesign in July of 2018. American Airlines Mobile App Subject Matter Expert.